Hats off to the class of 2008! Three day schools and three Jewish high schools held their graduations recently in Dallas. On June 1, Akiba Academy graduated its largest class ever, 25 students. Making up the graduating class were: Dalit Agronin, Justine Adrienne Berman, Bryan Benaim, Evelyn Joy Denemark, Chaya Mushka Dubrawsky, Jori Brianna Epstein, Jacob Meir Greif, Josh Hoppenstein, Alex G. Kaufman, Sheera Eliza Krengel, Benjamin Liener, Adina Devora Mandelcorn, Joshua Daniel Mirsky, Moselle Dominique Paz, Jordan Benjamin Prescott, Mina Rachel Pulitzer, Emily Rohan, Ben Romaner, Naomi Elise Rosenberg, Hannah Schepps, Gabby Steinbrecher, Yaakov Simha Tzuriel Meir Stolovitsky, Kevin Anthony Sulski, Cara Meira Tolmas and Ilana Emily Wernick. Just days after returning from their long-awaited eighth-grade trip to Israel, Levine held its commencement ceremony on June 5. Congratulations to the students in the Levine Academy class of 2008 who will now continue their education at the following schools: Connor Adell: Episcopal School of Dallas. Reagan Alhadef: Greenhill School. Elijah Benzvi: Frisco Centennial High School. Carly Bierman: Yavneh Academy of Dallas. Teal Cooper: Parish Episcopal School of Dallas. Samantha Danilewitz: Yavneh Academy of Dallas. David Dunsky: Yavneh Academy of Dallas. Ali Feinstein: Yavneh Academy of Dallas. Coreen Golan: J.J. Pearce High School. Melanie Goodman. Shepton High School, Elianah Gorin: Parish Episcopal School of Dallas. Riley Harmon: Shepton High School. Jillian Herstein: Yavneh Academy of Dallas. Tova Kline: Richardson High School. Andrew Leffler: Episcopal School of Dallas. Zach Prengler: Yavneh Academy of Dallas. Harris Rabinowitz: Shepton High School. Emily Rosenfeld: Yavneh Academy of Dallas. Matthew Rosenstein: Richardson High School Arts, Science, and Law Magnet. Jordan Rudner: Greenhill School. Jasmine Sidisin: Yavneh Academy of Dallas. Jessica Solls: Greenhill School. Nina Stern: Episcopal School of Dallas. Alex Weinstein: Episcopal School of Dallas. Tori Weinstein: Shepton High School. Mesorah graduation ’08 saw three capable young ladies — Johanna Corcos, Yael Glazer and Hila Hoffman — reach this important milestone. All three graduates will attend seminaries in Israel next year to solidify the foundations laid at Mesorah. They will participate in intensive Judaic studies, after which they each plan to return to pursue college educations. Sunday, June 1 marked the third commencement ceremonies for Texas Torah Institute (TTI). The class of 2008 consisted of three seniors: Elozar Liff from Brooklyn, N.Y., and Nechemia Kushner and Elimelech Sterns, both from Cleveland, Ohio. For the coming school year, two of the graduates will be coming back to TTI to study full-time in the yeshiva’s post-high-school rabbinical training program. The other one will be attending a yeshiva in Israel. Torah Day School recently held its fifth graduation ceremony for the school, which has grown from 165 students in 2003 to almost 300 today. Graduates were: (boys’ division) Binyamin Epstein, Alex Goldschmiedt, Ari Margolies, Aaron Oppenheim, Eden Rubinstein, Jacob Winston; (girls’ division) Sarah Abrams, Mimi Edery, Chaya Leah Kosowsky, Liat Rafaelov, Sivan Naor, Chava Miriam Rich, Devorah Rosenberg, Tamar Rosenberg, Laetitia Sebbag, Ela Wilson. Valedictorian of the boys’ class was Jacob Winston; co-valedictorians of the girls’ class were Sarah Abrams and Chava Miriam Rich. Yavneh Academy of Dallas celebrated its 13th annual commencement on May 25. The graduates included: Emily Ackerman, Bradley Alhadef, Samuel Ames, Emily Brill, Daniel Bonner, Sarah Epstein, David Fine, Alexander Hirschberg, Louis Huberman, Allie Kessler, Erez Krengel, Sara Levi, Gabriella Lewin, Aviva Linksman, Melissa Michelson, Zachary Moskowitz, David Naxon, Nava Newman, Robert Radoff, Grace Rosenthal, Michael San Soucie, Natalie Schachar, Hannah Schachter, Yardana Schick, Baruch Shawel, Ari Steinbaum, Tova Stolovitsky, Arye Zucker and Rachel Zbolon. Yavneh’s class of 2008 was accepted to 57 universities, colleges, and seminaries in the United States, Canada and Israel; they received over $931,000 in scholarship money and served over 11,000 hours of community service. From the Galveston coast to Dallas, by way of New York, Rabbi Yaakov Rosenblatt is living the tenet of l’dor v’dor, generation to generation. Continuing in the footsteps, or meat cleavers, of his great-grandfather Rabbi Abraham David Rosenblatt and his grandfather Max, the Dallas-based rabbi has taken the family business, A.D. Rosenblatt Meats, a kosher meat supplier to a whole new level. More than 750 pounds of glatt kosher meat was delivered last week to the Preston/Forest Tom Thumb store with orders for the Coit/Campbell store in negotiations. In Houston, the meat is available at Randalls. The 400 undocumented workers arrested at the Agriprocessors plant in the May 12 raid and their families are living in limbo, out of work and facing deportation. But now the fallout is beginning to extend beyond those most directly impacted. Not to leave the tradition of teaching led by his father Zev behind, Rabbi Rosenblatt and his wife Suri first came to Dallas in 2000 to learn and to teach with the Dallas Area Torah Association. The couple started DATA’s Plano branch. In 2004 Rabbi Rosenblatt left DATA, interested in starting a business. ”This was my family’s business; Rosenblatts had been koshering and selling meat since the 1870s. My grandfather was a shochet and ritual director in Galveston early in the last century and it was my turn.” One of 11 children, Rabbi Rosenblatt is joined in business by his brother, Abraham David, who represents the company in sales. In March of this year, A.D. Rosenblatt started basing the majority of its business, about 200 cattle a week, from a plant in Harper, Kan. 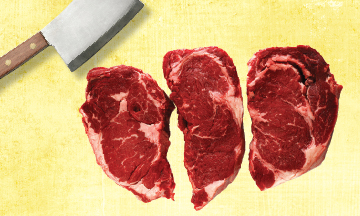 Available cuts include boneless chuck, chuck tender, chuck flanken, minute roast, whole, export and bone-in navel ribs, marrow and neck bones, skirt steaks and tongue. Glatt, which literally means smooth, means the animal’s lungs contain no questionable adhesions. The term is commonly used to describe a higher level of Kosher supervision. “There is a strong demand for this level of kashrut and we’re proud of what we are able to provide,” said Rabbi Rosenblatt. The company also produces Beit Yosef meat, “absolutely pristine,” said Rabbi Rosenblatt. The company is supervised by the OU, Orthodox Union, CRC, the Chicago Rabbinical Council, and Star K. In addition to the A.D. Rosenblatt label, the meat is sold under the Abeless & Heymann and California Delight labels. JTA’s Sue Fishkoff contributed to this report. We welcome hearing from Laurel Ornish, who tells the TJP: “The Plano branch of DATA, the Dallas Area Torah Association, will hold a ceremony on Sunday, June 22, at 1 p.m. at the DATA of Plano Center to dedicate its first-ever sefer Torah. The entire community is invited to attend. “The center is located at 3198 W. Parker Road, Suite 3124, Plano, between Half-Price Books and Firestone Tire. “The event will feature inspiring talks, dancing with the Torah and refreshments. “The Torah scroll, to be named the ‘Verschleisser Family Torah,’ is a gift from Moshe and Annette Nudell of Baltimore, Md., in honor of Mrs. Nudell’s parents, Shmuel and Sarah Verschleisser, and in memory of her brother, Moishe Verschleisser. The Nudells are the parents of Mrs. Shifra Robkin, wife of DATA of Plano Co-director Rabbi Yogi Robkin. “The ceremony will signal the beginning of a new era at DATA of Plano, which has experienced tremendous growth since it was founded five years ago by Rabbi Shimshon and Sara Silkin and, most recently, Rabbi Chanoch and Sarah Oppenheim. “‘The Oppenheims took a core group and developed it into a community,’ says Rabbi Nesanya Zakon, co-director with Rabbi Yogi Robkin of DATA of Plano. ‘Getting a Torah means that we can hold regular, weekly Shabbos services. Young families are moving into the neighborhood to be part of DATA, and we hope it will become another successful, full-blown Jewish community like the ones south of LBJ and in Far North Dallas. “Along with Shabbatons every three weeks, DATA of Plano currently offers several ongoing classes, including three classes for men: a Sunday-morning Tefillin Club, a Monday-night Talmud class and a Wednesday lunchtime class on personal development. A four-week series for men and women on Tuesday evenings, ‘Secrets to a Stress-Free Life,’ began June 3. Additional programs for the whole family will be added in late summer. “For more information, call Rabbi Zakon at 214-987-3282, ext. 102. “DATA of Plano is a branch of the Dallas Area Torah Association. Since its founding in 1992, DATA has become the premier Jewish learning institution in North Texas, providing classes, special events, ongoing programs, personal guidance to individuals and couples and other means to impart Torah wisdom to Jews of all backgrounds and levels of observance and of all ages. On May 27, Jewish Family Service hosted its annual meeting at Congregation Tiferet Israel with about 200 in attendance. The meeting included the installation of incoming officers: President Robin Sachs; President-elect Todd Chanon; Vice Presidents Steve Fisch, Cheryl Halpern and Ed Jerome; Treasurer Randy Colen; and Secretary Barbara Friedlander, and the installation of new board members: Richard Bernstein; Jonnice Berns; John Thomas Carlo, M.D., MSE; Sheri Goldberg; Ann Irvine; Michael MacAdams; Rabbi Debra Robbins; and Kathryn Tobolowsky. The evening also included a tribute to outgoing President William N. Roth, a special thank-you to Muriel and Ralph Pinkus for their generous and significant donation of land made to Jewish Family Service’s endowment, and a keynote presentation by Ambassador Enriqué Hubbard Urrea, consul general of Mexico. Jewish Family Service provides mental-health and social services to children, teens, adults and families without regard to religion, ethnicity or ability to pay. For more information, please call 972-437-9950 or visit www.jfsdallas.org. On May 30, Shearith Israel Preschool celebrated its second graduation class. Three out of the four graduates have been at the school since they were babies and toddlers. The program began with the students giving money to charity and lighting the candles to symbolically welcome the Sabbath. The children of the pre-K class were joined by their younger schoolmates to present a medley of Sabbath prayers and graduation songs to the families and guests. Rabbi David Glickman, congregational rabbi, spoke to the graduates about the value of getting a good preschool education. He compared their schooling to setting roots in the ground like a tree. This was very significant since the graduates’ families donated a Texas Redbud tree in honor of the preschool staff. A special presentation was then made to Mrs. Sheri Rosen for her work as preschool education committee chairperson. In addition Elizabeth and Michael Brothman were recognized for their innovative idea – the Truck Time fundraiser. Elizabeth and Michael spent hours working on this project for the last four years. They were presented with an engraved Miriam’s Cup water glass. The program concluded with the awarding of diplomas to Trever Brothman, Meira Sullum, Alex Sheena and Ava Wolfe. The graduates were accepted to kindergarten at Greenhill, Hockaday, Haggar Elementary and Akiba Academy. Mazel tov to the graduates and their families. Over 200 golfers, both children and parents, gathered at Top Golf in Dallas May 18 to participate in the first annual Equity Bank End of Schoolyear Bash! miniature golf tournament. The event raised over $50,000 and all proceeds went to the Gladys Golman/Faye Dallen Education Fund. The Gladys Golman/Faye Dallen Education Fund was created by Louis and Robin Zweig when they were faced with the challenge that their son David, who has Asperger’s syndrome, might not be able to celebrate his bar mitzvah. The Zweigs discovered that there was a glaring need in Dallas to train and educate the city’s religious-school teachers to enable children with learning differences to be successful in their classrooms. The fund finances educational seminars and training days, and focuses on helping teachers and religious-school leaders develop classroom strategies for learning differences such as autism, Asperger’s Syndrome, ADD/ADHD, dyslexia and other neurological disorders. Congratulations to Susan and Allen Luterman on the birth of their third grandchild and first boy. Harrison Samuel Luterman was born on April 30, 2008 in New York City to Nikki and Stephen Luterman, weighing 7 lbs. 6 oz. and measuring 21 inches long. He joins his sister, Chloe Olivia, 3 years old. Added congratulations to Susan Candy Luterman on being elected vice-president of the International Association of Hebrew Free Loans. Susan was the first woman president of Dallas Hebrew Free Loan, 2001-2002, and her husband, Allen, was international president, 2001-2002. Chuck Smith was re-elected for a second year as president of Congregation Beth Torah at the synagogue’s annual meeting in May. The vote by acclimation also installed the synagogue’s leadership for the coming year. They include vice-presidents: Liz Cox, executive; Vikki Silvis, financial; Lyn Jacobs, education; Neil Burnstein, ritual; Mark Kreditor, development; Bennett Robinson, membership and Tony Tello, secretary; and Mark Machbitz, treasurer. The new at-large board members are Eileen Kessner, Elizabeth Stein, Gilda Daniel, Andy Shane and Scott Bennett. The entire board will be installed in a special ceremony during High Holiday services. Congregation Anshai Torah has installed Debbie S. Katz as president for 2008-09. Also serving in the coming term are Neil D. Rubinstein, immediate past president; vice-presidents Stuart Rosenfield, executive and Kathryn S. Kaplan. Others are Nancy Rabhan, Michael Roy, treasurer; Harvey Wine, financial secretary; Suzy Harmon, recording secretary and Michelle Meiches, corresponding secretary. Advertising legend and humanitarian Liener Temerlin, a member of the American Advertising Federation Hall of Fame, has donated to the DeGolyer Library at Southern Methodist University his collection of business papers chronicling most of his 56 years in the communications business as well as his remarkable philanthropic history. Temerlin’s donation joins other significant collections of business papers at DeGolyer from such notable sources as Stanley Marcus, JCPenney, Roger Horchow, Ebby Halliday, and Texas Instruments. The donation was presented at an evening reception on, May 14 in the DeGolyer Library attended by Dallas business and philanthropic leaders. Temerlin began his career in advertising in 1953 as a copywriter for Glenn Advertising, a small agency in Dallas. For the next several decades, he guided the company as it grew and, with acquisitions and mergers, changed names many times, evolving from Glenn, Bozell & Jacobs to Temerlin McClain. He is widely credited with helping to bring, for the first time, major national and international advertising accounts to Texas and the Southwest, including American Airlines, Armour, Bank of America, Bell Helicopter Textron, Bennigan’s, Centex, Cessna, Chili’s, Continental Bus Lines, Dial Corporation, Entrust, ExxonMobil Corporation, Greyhound Corporation, GTE (Verizon), Halliburton, Hyatt Hotels, Long John Silver’s, Max Factor, Nationwide Insurance, Nortel Networks, Overhead Door Corporation, Pace Picante Sauce, JCPenney Corporation, Philippine Airlines, Pfizer, Quaker Oats, Sara Lee Apparel, 7-Eleven, Steak and Ale, Subaru of America, Terminex, Tone Soap, Texas Instruments, Trailways Bus Company, Warner Lambert and Zale Corporation. Papers relating to many of these accounts are included in the archival gift. Researchers should be able to use parts of the collection by the fall semester of 2008. The collection incorporates material from the 1953 through 2000, including Temerlin’s daily correspondence files over a period of two decades. Also included are numerous TV commercials, layouts for ads that were both accepted and rejected, and new business presentations, both the successful and the fruitless. To meet the needs of expanding retail clients like Hyatt and Philippine Airlines, Temerlin opened offices around the world, in Europe, Asia and North and South America. This national attention began to help other agencies procure talent and corporate clients from outside Texas and the Southwest, which, in turn, helped Dallas become one of the premier agency centers in the country. Under Temerlin’s leadership the agency became not only the largest agency in the Dallas/Fort Worth Metroplex, but in the Southwest. In addition to his business accomplishments, Temerlin also has a long-standing reputation for his civic and community involvement. He has received numerous awards and special recognition for his contributions to advertising, the arts, and philanthropic programs, including the Linz Award and the Silver Cup Award. He served as president and chairman of the Dallas Symphony Association and chaired the opening fortnight of the new I.M. Pei-designed Morton H. Meyerson Symphony Center. He also serves as chairman, festival director and founder of the annual AFI DALLAS International Film Festival. Included in the collection are papers and marketing plans on a number of his pro bono activities, an example of which is the American Film Institute. The papers reflect not only his leadership role with AFI DALLAS during the past two years but also with the American Film Institute in Los Angeles, where he served on the Board of Trustees from 1989-2002, the Executive Committee from 1989-99 and the Board of Directors from 1989-2000. In 1989 he developed the “100 Years, 100 Movies” concept of AFI celebrating the centennial of the motion picture. His idea and marketing plan set the stage for AFI’s enhanced national profile, and brought distinction and major financial gains to the organization, totaling more than $15 million to date. It was Temerlin who developed the “100 Best” concept celebrating the 100th anniversary of American film: The 100 Best Movies, The 100 Best Stars, The 100 Best Laughs, The 100 Best Thrills, etc. When he retired from the Board of Directors in November 2000, the AFI Board made him an Honorary Trustee of the American Film Institute, a first in the AFI Board’s history. Liener Temerlin’s relationship with SMU dates back more than 20 years. He has served as a member of SMU’s Board of Trustees, the Committee on University Development, and the Executive Board of the Meadows School of the Arts. When Temerlin was on the Madison Council of the Library of Congress, he was instrumental in bringing the Judaica Collection to the Meadows Museum, which was the most successful exhibit at the museum up to that time. In 2001, his friends and associates joined with SMU to honor him by endowing SMU’s Advertising program, which was renamed the Temerlin Advertising Institute (TAI). It has since become a nationally recognized program for advertising education. On Wednesday, May 14, Ann and Nate Levine Academy honored past board president and alumni parent, Andy Cohen, with the Esmé and Errol Jacobson Etz Chaim Award. The award, instituted in 2005, was established to recognize Esmé and Errol Jacobson, who embody the highest degree of generosity, kindness, compassion and commitment to our community. All recipients of the award must possess those same qualities. Andy’s commitment to action is evident in the numerous leadership positions he has taken locally and nationally. His involvement at Levine Academy includes serving as president of the school board and vice president of education, and serving as a member of the executive committee, board, liaison committee and fundraising committee. In addition, Andy served as a vice president and board member of Congregation Anshai Torah. He is currently serving his second and final term as president of the Solomon Schechter Day School Association. Andy and his wife Karen have three children – David, Emily, and Jessie – all graduates of Levine Academy. The rosh kollel based his talk on a letter written in 1905 by Abraham Isaac Kook, who was the first Chief Rabbi of modern Israel – even before the state was officially declared. The letter was Rabbi Kook’s response to a correspondent who questioned whether Judaism accepted evolution or took a literal view of the stories in Genesis. After considering the question from several angles, the rabbi answered that Judaism accepts scientific findings while generally viewing the biblical tales as parables. Metroplex Breakfast Dialogues began in 2002 as a place for addressing local and global issues, including peace and justice, in a congenial atmosphere. Open to all, the group meets monthly for a buffet breakfast, speaker presentation and discussion at Canyon Creek Country Club, Richardson. For more information, e-mail metrodialogues@yahoo.com or call the group’s founder, Jerry Middents, at 214-369-1981. Folks everywhere remember Simon Sargon’s long successful association with Temple Emanu-El’s music department. Recently, Sargon, professor of music at SMU’s Meadows School of the Arts, was named the 2008-09 Meadows Foundation Teaching Professor. The award is presented annually to a tenured Meadows faculty member for a “sustained commitment and dedication to teaching at the highest level,” and is one of the most important awards bestowed by the Meadows School. The award carries an honorarium of $5,000 for the faculty member and another $5,000 that may be used for professional needs, support for creative work, research or teaching. Warden added, “Sargon’s faculty colleagues cite his knowledge of languages, poetry, music theory and music history, his organizational skills and his effectiveness as a caring and giving teacher.” Former students who have benefited from his extensive knowledge of opera and art song are working at or have performed at the Chicago Lyric Opera; the New York City Opera; the operas of Cleveland, Santa Fe, San Francisco, Houston, Paris and La Scala; the Metropolitan Opera; and even on Broadway. “Sargon’s teaching is intimately connected to his excellence as an artist,” Warden said. “His work as a composer is respected by musicians, performers and academicians. His compositions for horn, flute, clarinet and his first symphony have been the subjects of four doctoral dissertations at different universities. In the summer of 2008, he will be honored with a concert of his works at the national convention of the American Conference of Cantors to be held in San Francisco. Over 300 walkers and runners participated in the Aaron Family Jewish Community Center’s 22nd Annual Bagel Run, Sunday, May 18. Forty-plus children ran the Kid’s K, and over 300 adults participated in the 5K and 10K. All of the kids who ran the Kid’s K received winged foot medals, and the top three finishers, male and female, in each age group of the 5K and 10K earned awards for their great efforts. Kiplimo Chemirmir was the overall winner of the 10K with a time of 33:59 while Jennifer Ozuna took home the top prize for the females in the 10K with a time of 50:49. In the 5K, Joseph McKenna took home top honors with a time of 17:10 and Cherilyn Hefter topped the female field with a time of 21:45. Unique to the race was the category of fastest rabbi, which went to Rabbi Joe Menashe, who completed the 10K in 53:08 — and he did it while pushing a stroller. Bagel Man ordered up some beautiful weather, then made sure everyone got to enjoy plenty of great bagels from Tom Thumb. A special thank-you went out to Jeff Whitman and Key-Whitman Eye Center, who co-sponsored the race with the J this year. Bagel Run Chair Mark Kreditor, the sponsors, the wonderful volunteers and the JCC staff all worked to make this year’s run the most successful Bagel Run ever! Jon Mize is director of sports and fitness at the Aaron Family JCC.